For the past several years, the City has applied for and received grant funding for its defensible space efforts, which includes fuel reduction projects, a residential assistance program, a free tree limb chipping service program, and defensible space education. We are waiting to be funded for 2018. 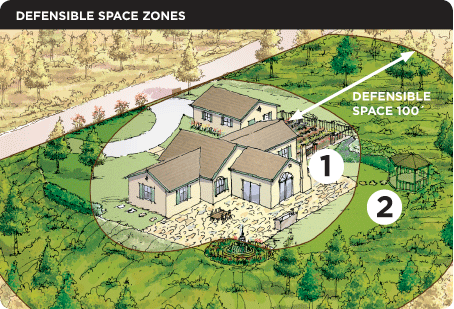 Defensible space refers to the area between a house and a wildfire where the fuel sources have been modified to reduce the threat of destruction to the house. Property owners have a year-round responsibility to maintain vegetation on their property in a condition that will not contribute to the spread of fire. Effective fire prevention measures can keep fires from starting and reduce hazards that threaten yours and your neighbors’ property. For more information on defensible space, please read the PREVENTATIVE MEASURES FOR THE URBAN/WILDLAND INTERFACE AREA guidelines. The chipping service, which helps residents manage tree limbs, shrubs, and other cuttings generated from controlling vegetation that would fuel a fire near their homes, has proven to be extremely popular. You cut it, you stack it, we’ll chip it. The first fuel reduction project, which was completed in the late summer of 2012, greatly improved fire conditions for residences located near Ward Creek. The most recent fuel reduction project, which was completed in 2015, focused on the Ziele Creek area and critical evacuation routes in the Hayward Hills. 2016 focused on the chipping program, inter-agency collaboration, and creating a pilot resident assistance program. In 2017 we implemented our residential assistance program. This pilot program allowed approved residents who have limited physical abilities or need economic assistance to cut down vegetation on their behalf and subsequently stack the fuel for chipping or green waste disposal. 2018 programs have not been funded yet. Please check back at a later date for more information and application process. For more information please call Fire Administration at 510-583-4930.